So be honest with yourself now. Do you really want to live in Canada? If you do, make it about YOU. 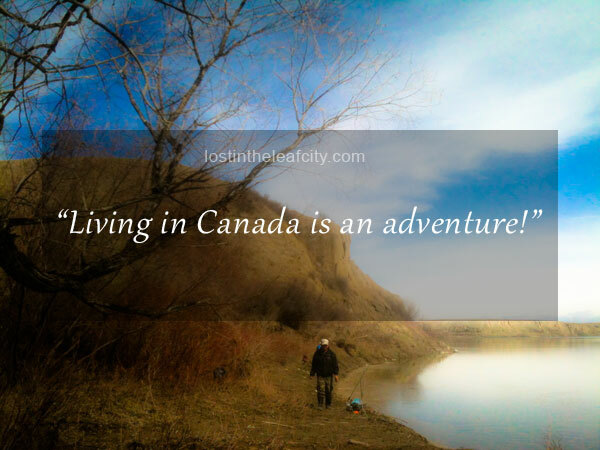 Do you want to explore the Canadian Rocky Mountains? Do you want to discover yourself: nurture your strengths and acknowledge weaknesses? Do you want to meet and learn from people? It’s all about YOU. No you are not suffering from hyper-selfishness syndrome. Because if you want to roam Canada where the sun shines but you start backpacking to Cancun the moment everything is covered with snow then it’s just the travel bug that bite your skin. But if you want to learn how to sound like a Canadian and eat foods from around the world and experience everything that comes with living in Canada then welcome aboard. You are meant to live a new life in Canada eating pancakes with maple syrup for breakfast (or whatever time of the day). And don’t feel guilty by abiding to the wishes of the royal highness in charge—you. Others have migrated to other country where they didn’t know anybody and don’t have much or worst nothing at all. Their stories are an inspiration to everyone: watch Cesar Millan: The Real Story and read Angela’s Ashes by Frank McCourt. For dog lovers you probably heard of Cesar Millan as the “Dog Whisperer.” He is famous in using his technique of rehabilitating dogs and training people. Long before his success, Cesar Millan has made the decision to follow his dream to become the best dog trainer in the world. Literally he went from a safe zone to the illegal zone when he crossed the border from Mexico to USA. While Frank McCourt, an immigrant from Ireland, wrote his autobiography “Angela’s Ashes.” (There is also a movie version.) Driven by poverty and dream, he boarded a ship to the USA where he seized opportunities and endured more hardships. They made it. But they have to trade a lot of things in life: first is the safety in familiarity, second is someone dear to them. The OLD self who doesn’t want to change. Bad habit has to go and replace it with a good one. It’s going to hurt struggling against yourself every single day. At the end of the day yourself is the most trusted and loyal ally. So please befriend yourself. Are you ready to take a RISK? It’s a good thing I love movies and dogs and books. Sometimes dogs outnumbered the number of people in the park. A person can walk with six furry creatures walking and stopping to look at the view. Life is indeed beautiful from a pawful perspective. I smiled when a new friend noticed how I am fond of books and said the words of wisdom I’ll never forget. You have a companion for life. Living in Canada has allowed me to read more books in a year in spite of work and other random things I preoccupied myself with. How about you? What are the activities and things that energize you? Do you like photography or cook new recipe? Maybe you like to visit museums or parks. Whatever your hobby is make sure to find time for it wherever you are. Keep on learning new things and make new friends but don’t forget about the inner self—the true you. So keep on doing what you LOVE to do. If you still have doubts on why you should live in Canada then maybe it’s time to ask yourself the toughest question that I overlooked as a newcomer in Canada. I was able to prepare as much as I can for the job that awaits me. I psyched up. I thought of the opportunities and trials. That was all I can do at that time. Years later, I realized that I’m a work in progress. By living a life in a land I am befriending every single day, I have witnessed the worst and the best part of me. It is terrifying and at the same time amazing to know that you are in control of who you will turn out to be. We can’t control the circumstances or the action of others. But you get to choose on how to respond. Choose the lesson from experience. Choose to press on. I have the habit of reading the newspaper and then cutting whatever part I like to keep. I cut out this quote and it always stares at me whenever I’m on my desk (usually when I deal with my bills and tax). I bought her book at the Calgary Reads Book Sale last year. I haven’t read the book yet but I remind myself of her words. The endless possibilities of what we can do terrifies us. Each day you have the chance to create, become a better person . We spent time thinking of what career to choose, car to drive, house to live in but have you thought about of who you want to be? A person who loves to love. Someone who strive to keep on learning and sharing. Find the time to put a smile on everyone’s face. A person who appreciate whatever the weather outside and indulge in a favourite treat without guilt. We can never guess what it’s like to meet our future self. I’m sure he/she will be unique and extraordinary. Do you doubt me? You’ll see. You might not recognize yourself. Have you reached a decision? Or are you already checking the baggage weight limit of the airlines? Share your dreams with us. Thank you. This 2-part blog post is inspiring. I’m also carefully scrutinizing myself why I want to immigrate to Canada. Mostly it’s because I want to start new. A new adventure to conquer. My entire life to me is an adventure. I’ve been through a lot here in the Philippines — gained employment, promoted quickly, gave up corporate to volunteer at church, took up a side business — in all areas I’d say I achieved what I want to achieve. And now I’m aching for a new endeavor. I know there’s no turning back. Once the wheels start to roll, I can’t turn back. I must finish to the end. I’ve read. I’ve asked advice. Now I need to step up and execute it. I’m studying caregiver po ngayon sa TESDA at sa awa ng Diyos malapit na ako matapos. Gusto ko po talaga magtrabaho sa Canada upang matulungan ang aking pamilya. After reading your blog ate, nakakainspire po! Sana kung makapunta ako sa Canada makita kita hehe. Nang dahil sa blog mo ate na motivate ako para magsikap ng todo todo hehe. Salamat ulit ate. So inspiring ❤ Thank you for this ate! Welcome Angie! 🙂 Good luck to your endeavour.